The BBFS-222 Big Blue filter systems are shipped completely pre-assembled. Water filters are sold separately, which allows you to purchase the best water filters for your water supply. All of the Big Blue housings are manufactured with durable polypropylene, have excellent chemical resistance and are ideal for many residential, commercial and industrial applications. Ideal for homes, farms, private wells, restaurants, swimming pools, spas, and trickle irrigation. 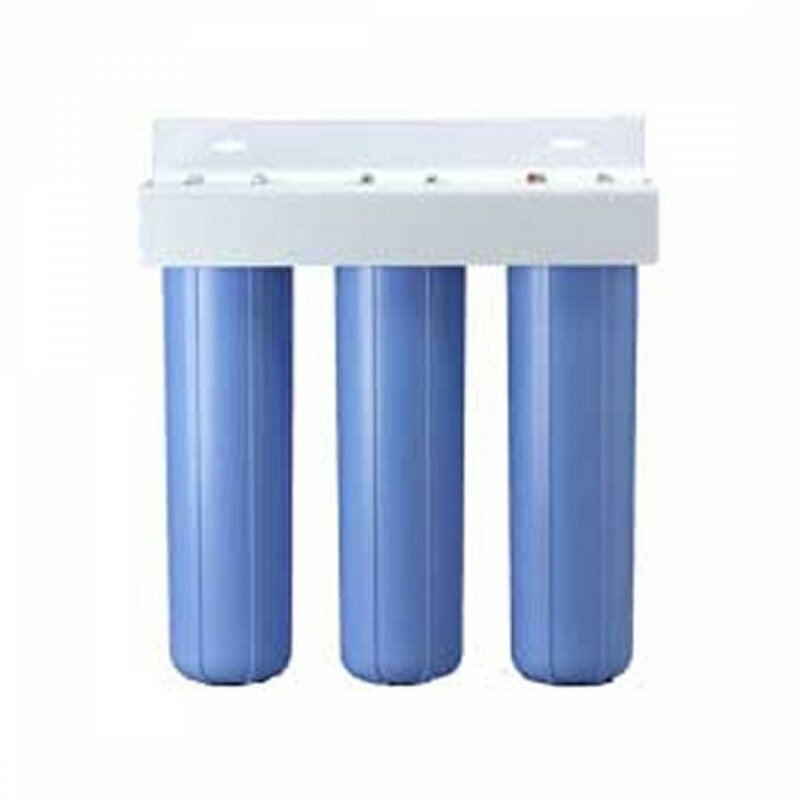 The BBFS-222 Water Filter System includes three large capacity number 20 Big Blue housings with a 1 inch inlet/outlet for greater water filter cartridge capacity and higher flow rates with minimal pressure drop. The Pentek BBFS-222 multiple housing system includes wall mounting bracket and hardware. The BBFS-222 water filtration system has a pressure relief button to relieve housing pressure when replacing the water filter cartridges. Home Applications: Rust Particles, Iron (insoluble), Sediment, Taste/Odor. Commercial Applications: Deionization, Coalescing, Combination, Sediment/Rust Particles, Taste/Odor, Duplexing. Industrial Applications: Step-down Filtration, Circulating Baths, Plating, Batch Treatments, Color Reduction, Organic Reduction, Cooling Towers, Pre RO Filtration, Duplexing. Whole House housings extend the life of washing machines, water heaters, and other household appliances. Leaking is prevented by the dynamically sealing O-Ring. The O-Ring should be replaced periodically to prevent leaks. 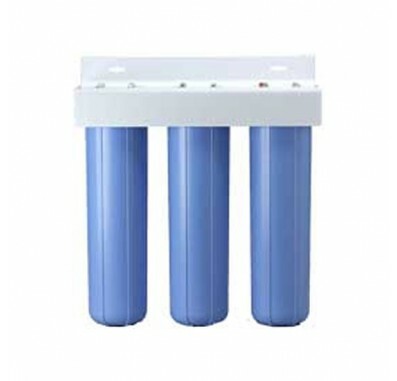 BBFS-222 Filtration System Filter Cartridges: By installing the sediment filter first, the carbon filter will last longer because it does not get clogged with sediment. Since carbon filters are more expensive, it is better to have the sediment filter first that needs to be replaced more often. The first two housings may be used for sediment reduction. The first housing can be used for a higher micron sediment filter and the second housing can be used for a lower micron sediment filter. The third housing can be used for the carbon taste and odor water filter. An example application is the first housing containing a DGD-7525-20 filter, the 2nd housing containing a DGD-5005-20 filter, and the 3rd housing containing a carbon filter such as the RFC-20BB to improve the taste and odor. The water filter cartridges are not included with the housing. This allows you to purchase the best water filters for your water supply. Sediment water filters reduce dirt, sand, silt, sediment, rust particles, and scale particles. Choose from our sediment water filters at the 20" x 4.5" Big Blue Filter Page. Drinking water filters produce healthier, better-tasting drinking water by reducing chlorine taste and odor and other contaminants. Choose from our carbon drinking water filters at the 20" x 4.5" Big Blue Filter Page. Replacement OR-100 O-Rings. Three o-rings are included with the housing purchase, but you should replace the o-rings periodically to prevent leaks. Use the SW-4 housing wrench to remove the sumps. The wrench should NOT be used to tighten the sumps back onto the cap. Tightening may cause damage to the o-rings. If needed, replacement pressure relief button kits can be purchased. 20" (508 mm) Big Blue sumps are interchangeable with 10" (254 mm) Big Blue sumps if you would prefer a smaller housing sump.